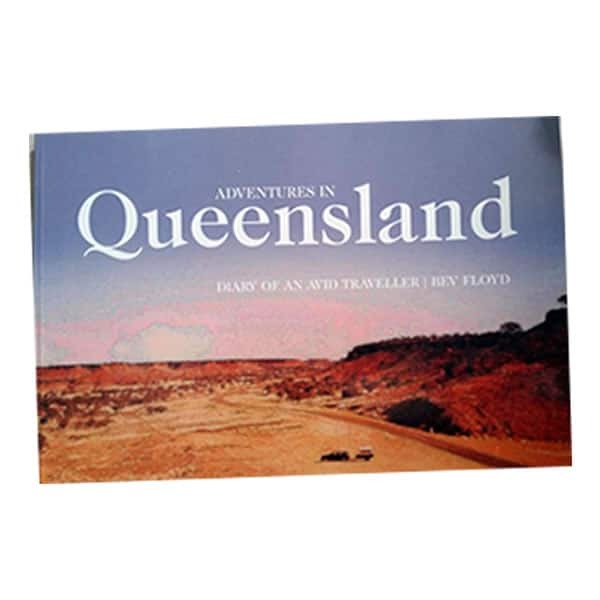 Adventures in Queensland is a book that describes Queensland through the eyes of a lone traveller and her dog. They travel to the Gulf of Carpentaria; out to the dusty opal-mining town of Yowah; on to the misty green Atherton Tableland and down the Queensland Coast. 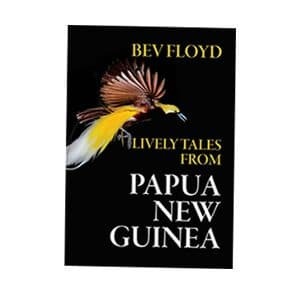 Everywhere they meet with adventures and Queenslanders who have stories to tell. 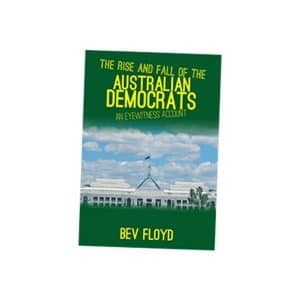 This is a richly illustrated book which recognises the amazing diversity of the State Queenslanders call their home. 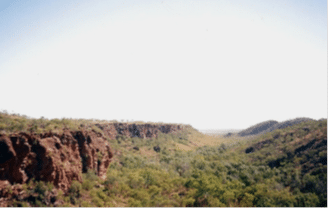 Boodjamulla [The park] is home to more than 140 bird species, including the Great Bowerbird, Red-collared lorikeet, crimson finch, zebra finch, kestrel, spinifex pigeon, barking owl, brolga, budgerigars, and the wedge-tailed eagle. It supports a large population of the Carpentarian grasswren and small numbers of the painted honeyeater. The rare purple-crowned fairy-wren is the park emblem. As we walked along the paths to go to the escarpment, we went under the myriad roots and branches of a Cluster Fig. This example was about 100 years old and still thriving. We passed a Livistona Palm; these are used for making hats, shaping baskets, making fishing floats; and it also has an edible core. Water in the gorge comes from a spring that goes underground before entering the gorge—Upper/Middle/lower. 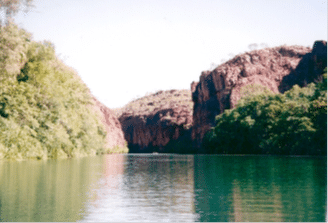 The Lower Gorge is sacred to the Aboriginal people as in their myths it is the home of the Rainbow Serpent —the creator. Photographs were not to be taken. Interestingly, it made me more intently aware of committing this very special place to memory. The area we were climbing composed geologically of ironstone and silica. The gorge itself is about 400 million years old. It wasn’t somewhere aborigines lived, but rather a special place where they came to carry out ceremonies. Reflections in the Gorge Lawn HillLawn Hill Gorge is formed by Lawn Hill Creek, which is fed by numerous freshwater springs from the limestone plateau to the west. The magnitude of the sandstone cliffs lining the gorge, its emerald waters and lush vegetation make it a visual splendour. 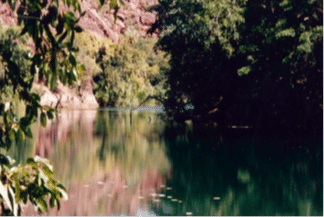 Serving as an oasis, the spring water and surrounding vegetation attract an abundance of wildlife. The Waanyi Aboriginal people have strong cultural ties with the park while pastoralists of European descent have more recent historical connections. Sandpaper fig with its very rough leaves, appeared as we climbed the path to the top of the escarpment. It was a tough climb and someone in our group stopped several times before eventually going back. I struggled on and finally made it. The view was tremendous—every which way. We could see straight down to the Middle Gorge (where we would paddle later in the day).